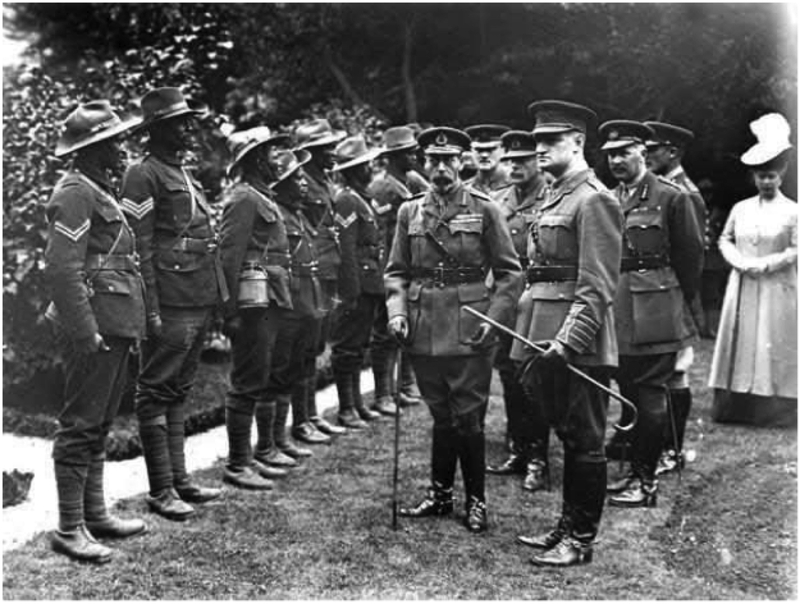 Soldiers on Parade for Visit by King George V and Queen Mary. In a 1952 paper entitled “The story of the Royal West African Frontier Force”, published by the Royal United Service Institution journal, Brigadier F.A.S Clarke (DSO) however attempts to give a more scholarly account of the origins, services and numerical composition of the Force. In telling the RWAFF story, he sums up his account of its activities with this assertion: “though the force habitually wore a scarlet suave jacket, fez, and cummerbund on ceremonial parades, it has never been merely a ‘picturesque constabulary’ as some would now have us believe”. He gives instances of laborious and painstaking operations,expeditions and invasions conducted by RWAFF units in their bid to capture enemy territory. More importantly, he provides the organizational structure of the force, as well as its numerical composition. According to him, the force consisted of a Headquarters Company, a Raffle Company, platoons and battalions. He equally notes that the total strength of a 1938 WAFF battalion, apart from British personnel, was 591 African troops and 219 carriers (those who bore the WAFF’s heavy loads of ammunition and supplies), with Nigeria providing the major quota. 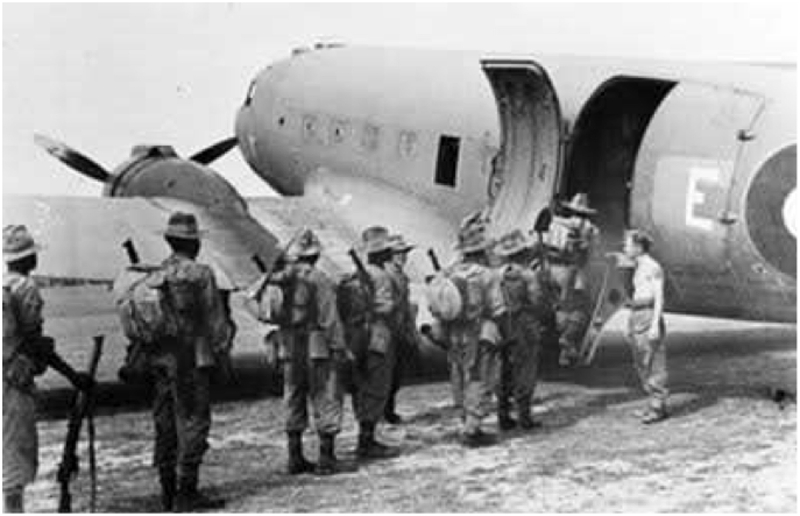 RWAFF troops boarding a military plane. 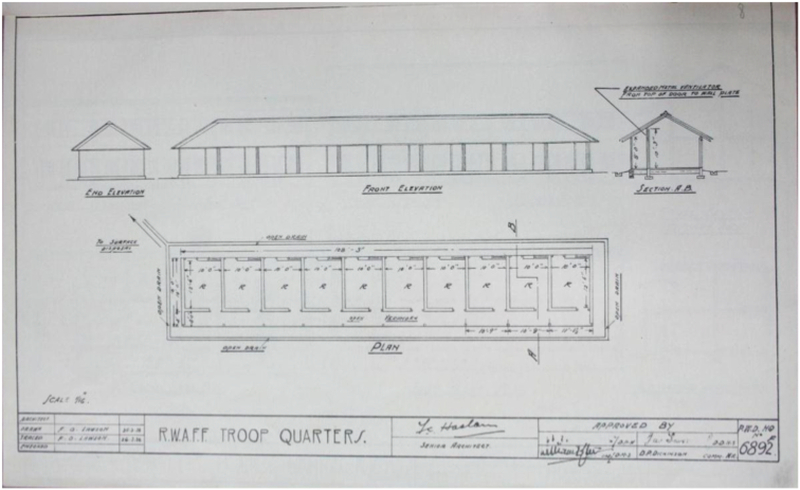 Drawing of RWAFF Quarters by the Nigeria PWD. The troop quarters consisted of a ten-room block with an external measurement of 108’3”. It was fronted by an open veranda, and surrounded by an open drain which conveyed waste water to a surface disposal system. Each room had an internal measurement of 18’6” by 10’0”, and was accessed through a doorway from the open veranda. Although each room had a rear window, the space between the top of the door and the wall plate was also fitted with an expanded metal ventilator. This enabled cross ventilation and adequate air flow within each room. The roofing favoured a deep gable design to facilitate rain water run-off during the frequent tropical rain storms.